Swan Lake In Fleet And Ferrets Too! 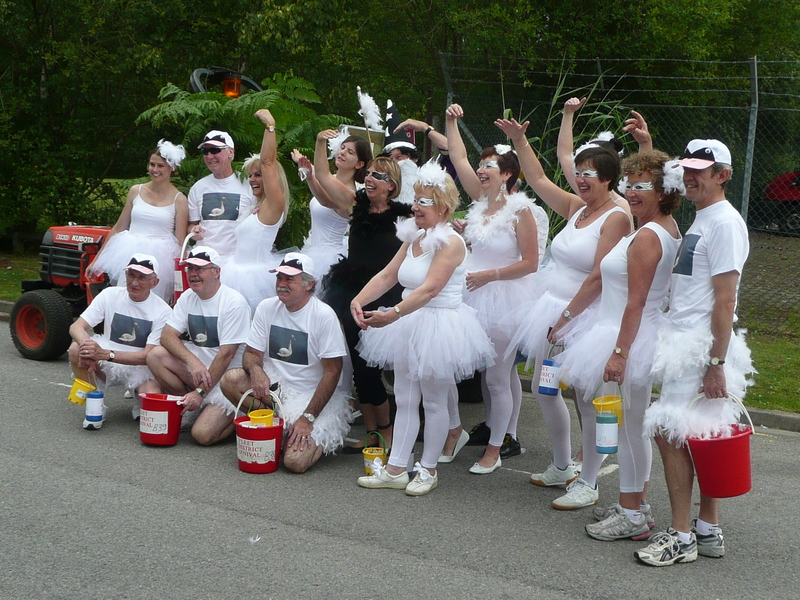 All profits raised from the carnival for 2011 are dedicated to the Clearwater Campaign, so a very special occasion for Fleet Pond Society (FPS). The theme for 2011 was ‘Princes and Princesses’ (inspired by the Royal Wedding) and FPS chose to imaginatively interpret this via Tchaikovsky’s Swan Lake! The Full Cast – Watch Out Royal Ballet! 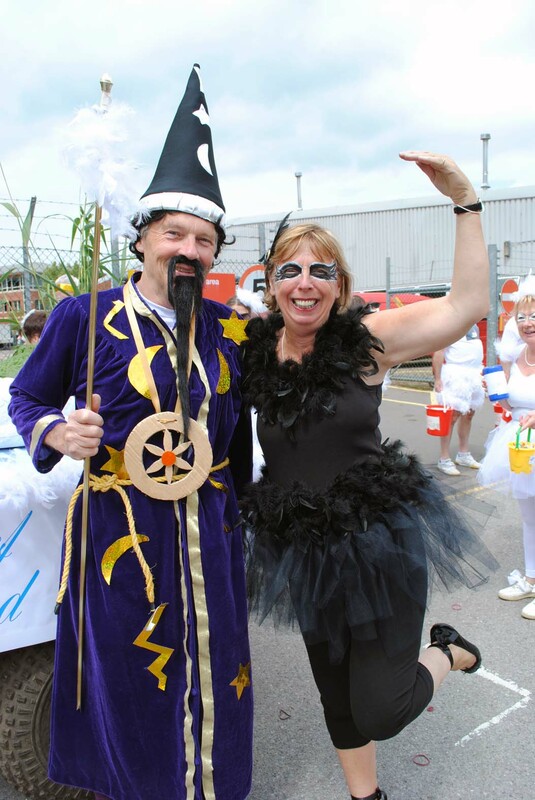 The Carnival Grand Procession took place at 3pm starting from the WaterFront Business Park. The top three pictures were taken here where the groups assembled. As you can see, FPS put in alot of attention to detail with some very impressive results! Many thanks to Terry Austin and Mandy Saxby for their unstinting efforts and to everyone else involved for really getting into the spirit of the occasion and for making it such an outstanding success. There’s Nothing Like Swan Enthusiasm! While hunting, Prince Siegfried sees an amazing swan. As he takes aim to shoot, the swan turns into a beautiful woman. The woman, Odette, tells the prince that she is a princess who has come under the spell of an evil sorcerer. During the day she must be a swan and swim in a lake of tears. At night she is allowed to be a human again. The spell can only be broken if a virgin prince swears eternal fidelity to her. She tells Prince Siegfried, who happens to be a virgin prince, that if he refuses her she must remain a swan forever.Prince Siegfried falls madly in love with Odette. However, through a spell by the evil sorcerer, he accidentally proposes to another woman at a party, believing that the woman is really Odette. Princess Odette feels doomed. She threatens to kill herself and throws herself into the lake. The Prince feels terribly sorry and throws himself into the lake with her. In an incredibly touching moment, the two are transformed into lovers in the afterlife. The procession ended up in Calthorpe Park where there were refeshments and a variety of stalls, including one for Fleet Pond Society. Interestingly the latter illustrated some additional benefits that FPS supplies to the local community. 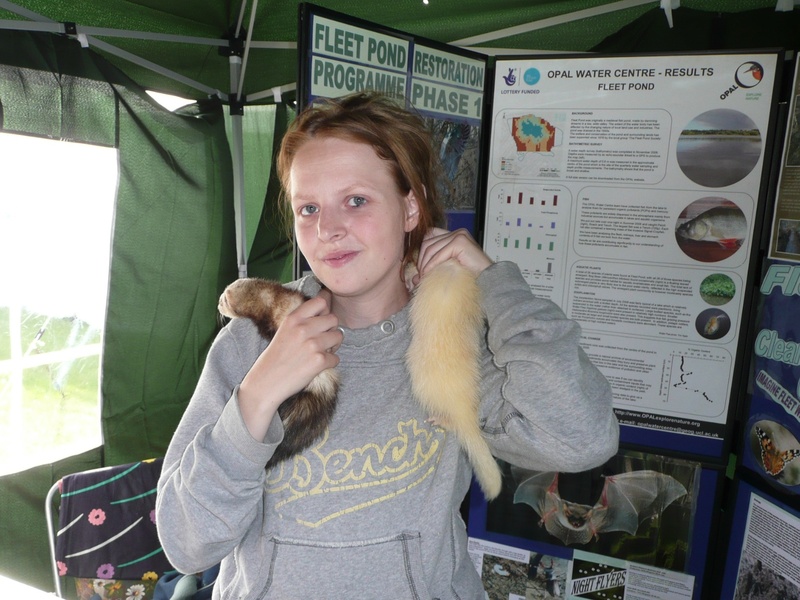 Out of the blue a lady called by asking for advice on ferrets and she had two in a box with her (photo below). Luckily Mavis Gray of FPS was on hand to immediately supply contact details for Ferret Rescue. Now who would have expected that! So another good result for all concerned. If you would like to support the future of Fleet Pond by joining FPS, please find details on this page. Picture credits: the top two and the fourth down were taken and kindly provided by Louise Isaacs and the other two are by me, David Pottinger. Please see Fleet People for additional pictures and information on the carnival. 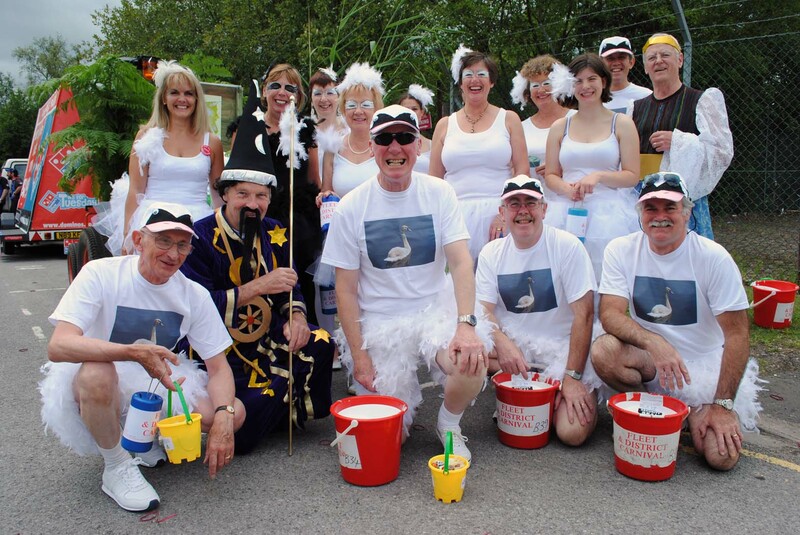 Fleet Carnival This Weekend – Come And See The Swans! Visit the carnival website for full details of all the exciting events over this coming Friday, Saturday and Sunday. All profits raised are dedicated to our Clearwater Campaign – thank you Carnival! 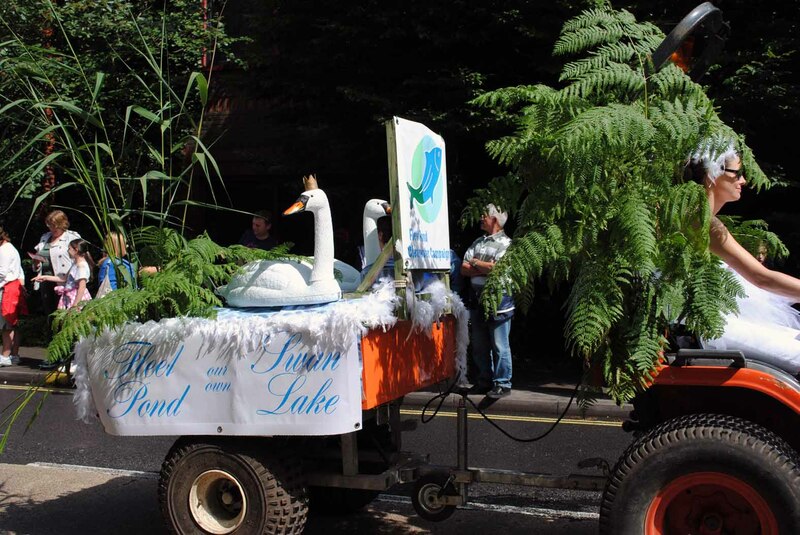 Come along and see the Swan Lake/Fleet Pond swans strut their stuff in the Grand Procession through Fleet town centre on Saturday at 3pm!! You are currently browsing the Fleet Pond Blog blog archives for July, 2011.